Burnley manager Sean Dyche says winning the Championship "means a lot" to him after missing out on the title in 2014. Dyche's side finished second in the 2013-14 season, eight points behind champions Leicester, and were relegated from the Premier League last term. The Clarets sealed top spot by beating Charlton 3-0 on Saturday, and will be presented with the trophy on Monday. "The main job is to get promoted. Once you've done that, you do want to win it," Dyche told BBC Radio Lancashire. "It means a lot because we did it two years ago and we couldn't quite catch Leicester, although we had a good go trying with how many games we won towards the end. "We made it clear at the beginning of the season our intentions, and I've been really pleased with that. We haven't blinked during it." 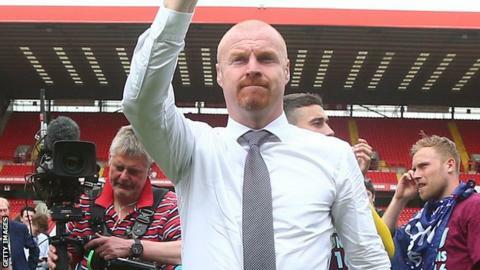 Burnley, who last won the second tier title in 1973, will be joined in the Premier League by Middlesbrough after they secured promotion with a 1-1 draw against Brighton on Saturday.